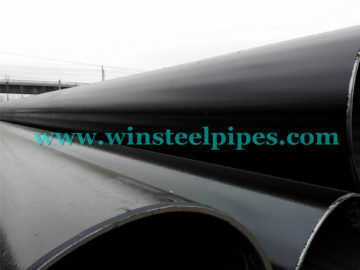 If purchase order requires API Spec 5L pipe to be supplied. 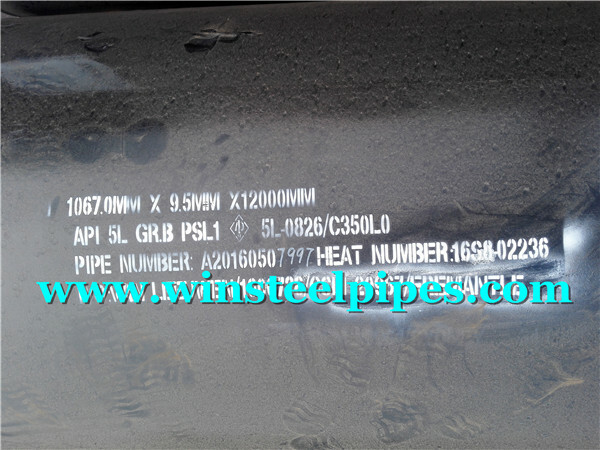 LSAW steel pipe marking identifying Spec 5L pipe shall be required. Additional markings, as desired by the manufacturer or as specified in the purchase order, may be applied but shall not interrupt the sequence of the required markings. 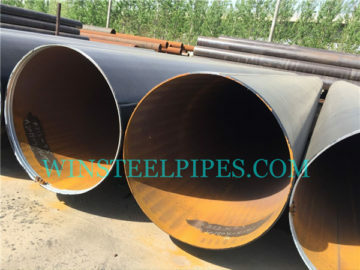 LSAW steel pipe manufactured in accordance with API 5L specification shall be marked by the manufacturer. 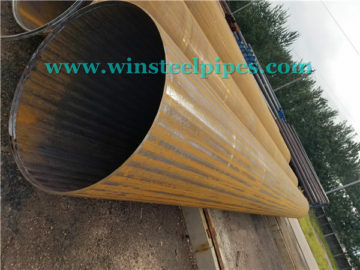 While the required markings are generally applied in a single straight line, the lsaw steel pipe marking are permitted to wrap around on to multiple lines provided the sequence of information is maintained as read from left to right and from top to bottom. 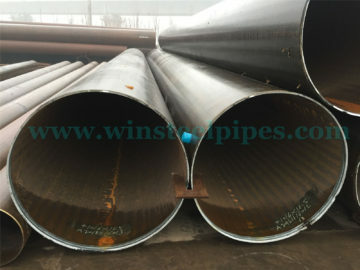 Such additional markings shall be located after the end of the required marking sequence or as a separate marking at some other location on the pipe. 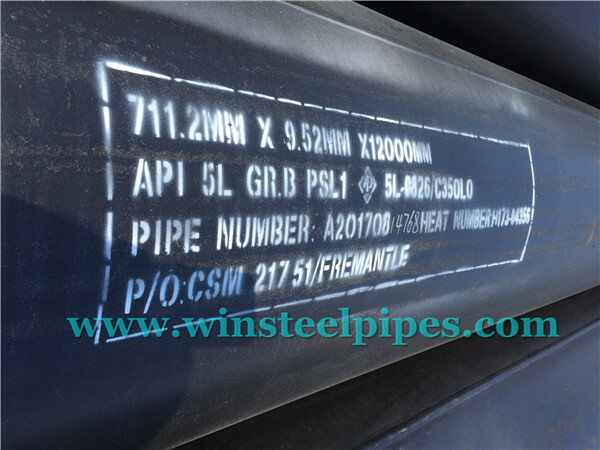 h) an identification number (Z), which permits the correlation of the product or delivery unit (e.g bundled pipe) with the related inspection document, if applicable. 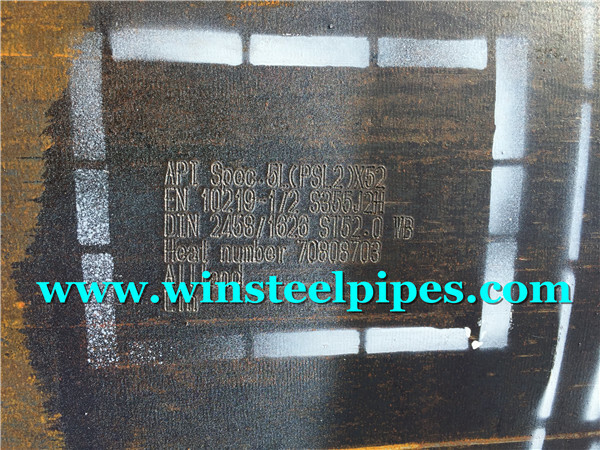 The location of identification markings shall be as follows: Welded pipe size 16 or larger- Paint stencil on the inside surface starting at a point no less than 6 in. 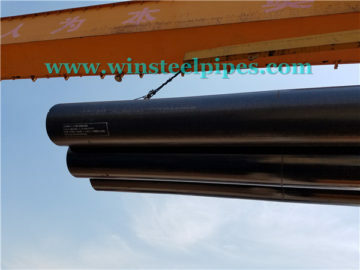 (152.4 mm) from the end of the pipe in a sequence convenient to the manufacturer, unless otherwise specified by the purchaser. If purchaser agreed, we will painted stencil on the outside surface. 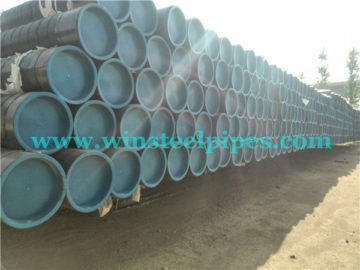 Because it is easy to see the pipe size. 1. Manufacturer: Manufacturer’s name or mark shall be the first identifying mark. 2. Specification: “Spec 5L” shall be marked when the product is in complete compliance with this specification. 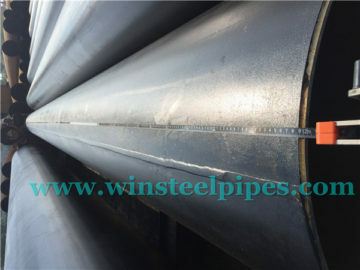 If steel pipe mill has API 5L Certificate, the API certificate No. should be showed on the pipes. 3. 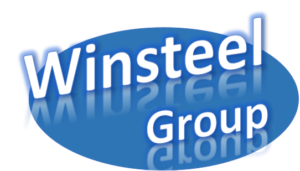 Compatible Standards: Products in compliance with multiple compatible standards may be marked with the name of each standard. 4. Specified Dimensions: The specified Outside diameter and the specified wall thickness shall be marked, except that, for the specified outside diameter, any ending zero digits to the right of the decimal need not be included in such markings. 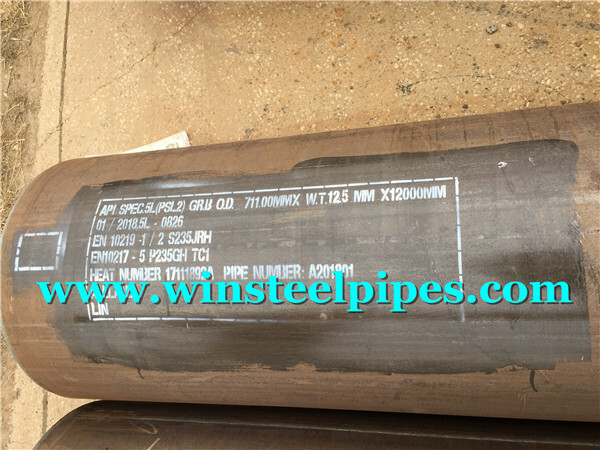 Cold die stamping is prohibited on all pipe with specified wall thickness of 0.156 in. 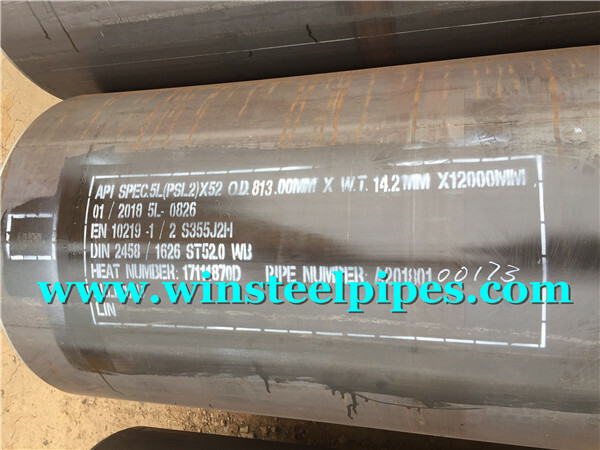 (4.0 mm) or less and all pipe of grades higher than A25 and not subsequently heat treated, except by agreement between the purchaser and the manufacturer and when so specified on the purchase order, pipe or plate may be cold die stamped.